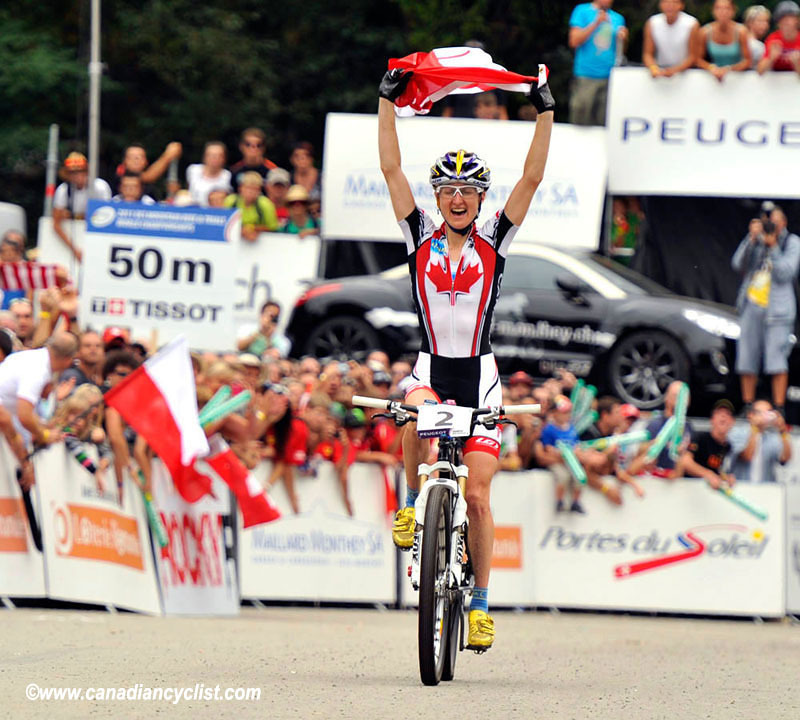 This year, Catharine Pendrel became the second Canadian woman in history to win the Elite Cross-country world title, 15 years after three-time winner Alison Sydor. Pendrel finished the season as the number-one ranked woman in the world, as well as taking three World Cup individual wins and finishing second in the overall World Cup standings. Earlier in the year, we talked with Catharine about doing an article on in-race nutrition but, due to her schedule, it wasn't really feasible to do it until the end of the racing season. It does need to be noted that Catharine races for the Luna team so, naturally, her specific choices are Luna and Clif Bar products. However, type and timing of eating when competing (or undertaking any hard, sustained effort) is critical no matter what products you choose to use. 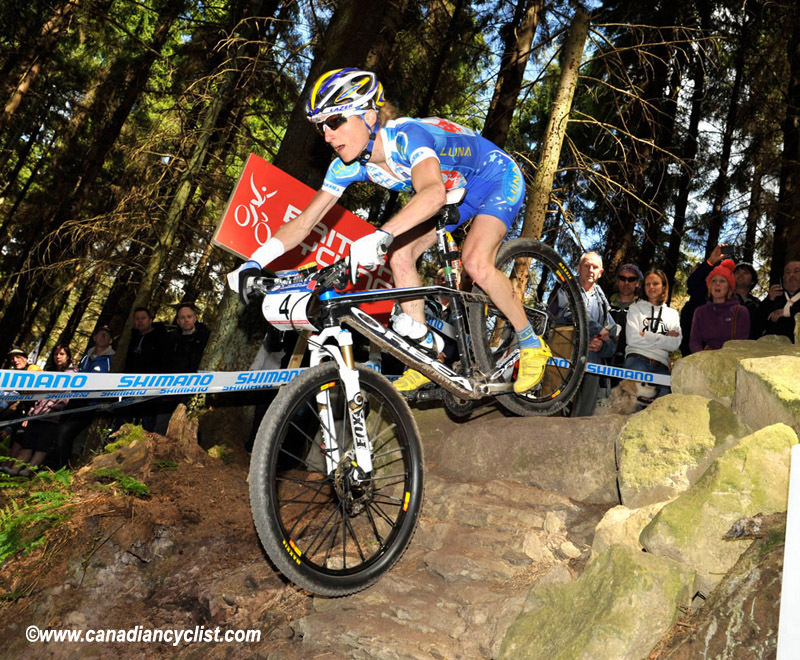 Canadian Cyclist: How important is eating during extended efforts, such as racing? Catharine Pendrel: If I'm not taking care of my need to eat, I'm not getting the most out of my training and my recovery is slower. I think all athletes grow an appreciation of good tasting, good quality food pretty quickly. There is nothing like doing the BC Bike Race (a 7 day MTB stage race) to drive home the idea that you are fuelling today for tomorrow. If you don't stay on top of your nutritional needs while racing and training you will notice it the next day, I promise! CC: What are the kinds of things riders need to think about to fuel their ride? CP: Hydration is always the most important. Water is great, but for long, hot or hard rides you'll need to add some electrolyte. With hydration taken care of, your body can absorb about 140 calories an hour, so if you are looking to stay on top of energy requirements you'll probably be snacking on something every hour of training, which I do. You'll only get the benefit of your bar, bloks or gels if you actually want to eat them while training though, so choose something that tastes and feels good in your stomach. I've seen too many people restrict their food intake while riding. Don't fear calories, choose good ones. Your body needs glucose and "bonking on a ride" is damaging, plus letting yourself get hungry usually leads to horrible eating habits when you get home. During and immediately after training are critical times to be fuelling to maintain consistent performance by enabling recovery and a healthy immune system. CC: What do you look for in an energy bar or recovery product? CP: I look for a bar that is made with quality ingredients - and equally important tastes great. I want it to be free of trans fats, hydrogenated oils, high fructose corn syrup; artificial sweeteners, flavours or preservatives. It should contain good carbs, some fibre, some fat and some protein. Most quality energy bar companies like Luna and Clif Bar put a lot of time and research into choosing good ingredients and balancing sugar sources with protein, fibre and fat for optimal performance and recovery. If you are racing, easily digestible and consumable sugar sources, like Clif Shot energy gels are what you need. For longer rides I'll eat bars to have something with substance in my tummy and a little more protein to carry me through the day and leave me ready to train tomorrow. CC: How do you break down your food needs? CP: Good quality ingredients. Balanced nutrition. Good tasting. Your body needs different things at different times - before, during and after training or during a race. I think as long as you make the most out of your consumption during the day - good quality and balanced meals, getting in good fats, veggies and fruits, carbs and protein - you don't have to be strict. Food should be fun, try new things, enjoy new flavours. You are a race car that deserves premium fuel! CC: What do you take before a race? CP: Before a race (about 3-4 hours out) I want something that feels good in my stomach and gives me some lasting energy. So in nutrition speak, carbs - including fibre, protein and a modest amount of fat. A bowl of oatmeal with berries and nuts is my favourite and helps me sustain energy levels and hold off hunger. About an hour before the race I'll have either a Chocolate Chip Clif Bar, a Clif Shot or Clif Shot Bloks energy chews. Experiment with this yourself. You may not be able to eat this close to training or racing; if your sugar levels are sensitive you may want to have a bar instead of a gel. Some people also have a tough time eating solid food before a race and this is where the Clif Shot Bloks the morning of and a good dinner the night before are nice. CC: What about during the race? CP: I set out my tools for a race, including what I eat, the night before. I have a plan for when to eat and drink. Eating and drinking in a race is important so know head of time where in a race you can drink or eat and make sure you do. My advice is set an alarm if you have to while racing and training. If my energy starts to go it's already too late. Having eaten something an hour before, I'll take 1-2 Clif Shots (gels) in a race with lots of water. They are easy to eat on the bike and go down quickly. Clif Shots are basically a mixture of organic maltodextrin and organic dried cane syrup which are fast-acting and can enter the bloodstream in about five minutes. CC: So, what do you eat after the race, and when exactly? CP: I always eat within 30 minutes of finishing a race or a training ride. This is the glycogen window you have heard of, and when glycogen can actually get into your muscles for proper recovery. For me, I can get this from a Clif Builder's bar. It's got 20g of protein and taste amazing. Don't forget to hydrate! CC: So you really like organic? CP: I love that Clif Bars are made with 70% organic ingredients. It's great to ride for companies you know love food and care about food quality and where their ingredients come from. As an athlete I am taking in a lot of fuel, the more good stuff is in it the better I feel. It shouldn't just be something that fills your stomach, but something that gives your body the vitamins, proteins, carbs and sugars it needs to perform optimally.